Floating some few hundred miles off the coast of California is a buoyant indictment of the current state of marine ecological wellbeing. Worthy of the moniker “Great Pacific Garbage Patch,” it is a stark example of the problem plastics and other non-biodegradable materials pose to the natural environment. 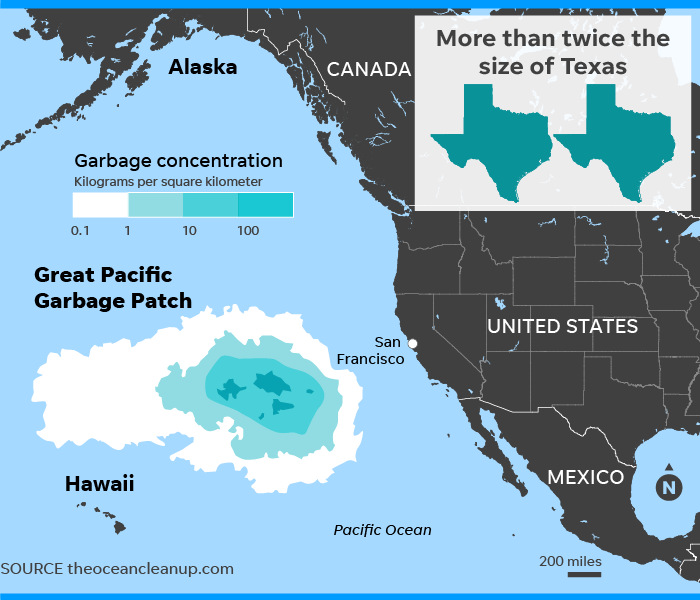 This floating patch of plastic waste now encompasses 600,000 square miles—that’s twice the size of Texas. Think of it as a new “landmass” in the Pacific Ocean. The floating environmental disaster is an illustration of the larger problem with how humans package goods and manage the trash we produce. At CultureWaves we’ve been following a few innovators who have plans to mitigate the ecological damage and shift the way we package products now and in the future. A stereotypical visualization of the plastic problem is the turtle entangled by a plastic six-pack ring. The beer company Carlsberg has an innovation that aims to solve the problem with sustainable packaging. It’s a solution so simple it will make you wonder why you didn’t think of it first: just glue the beer together. Sixers of Carlsberg beer, dubbed “Snap Packs,” will have small glue dots to hold them together and a sleek biodegradable handle. This Carlsberg initiative touts a 76% reduction in plastic usage compared to previous packaging. The new packaging launched in the UK in September and hits new EU markets in coming months. When you think of things like sugar, cornstarch and cooking oil you think of things that come in plastic containers, not things that make plastics. These are exactly the ingredients Crafting Plastics Studio used to create Nuatan, a biodegradable quasi-plastic. This fossil fuel-free product is bio-compatible, implying that when either animal or human consumes Nuatan it is broken down harmlessly in the body. This new plastic is fully moldable, blow-formable and 3D printable, just like its contemporary counterparts. As soon as the product is cleared as “food safe” it could change the food packaging landscape in terms of sustainability. Designer Vlasta Kubušová of Crafting Plastics Studio states: “Once we have the [food-safety] certificate, it can replace all the packaging we know.” A bold step toward reducing the human carbon footprint. Sustainability in the meals we eat is of growing importance, so naturally it is just as important that our beloved pets eat the same way. Only Natural Pet is producing high-quality and sustainable dog food, but felt the responsibility to package the food in an environmentally friendly way as well. The company partnered with plastic producers Braskem and Peel Plastics to produce the packaging for its Mindful Meals dog food, made with 30% bioplastic. Braskem’s bioplastic, called “I’m Green,” is made from Brazilian sugarcane. The product retains all of the properties and usability of oil-derived plastics without all the drawbacks of carbon pollution. In fact, the synthesization of the sugarcane product captures CO2 and releases O2. This gives the product a net-negative carbon footprint . . . or pawprint. As consumer demand places more importance on green initiatives, bio-packaging is solidifying its status as a versatile way to avoid the pitfalls of fossil fuel derived packaging. Companies such as Carlsberg, Crafting Plastic Studio and Only Natural Pet are just a few of the first movers shaping the way we will unwrap food today and in the future.